On March 8, 2016, Spanish news media reported the discovery of a cylindrical tank in the municipality of Hellín, in the province of Albacete. Rafael Fernández and José Manuel made the find while walking in a rural area known as El Pocico (one report placed it in neighboring El Pico), located about 8 kilometres southwest of the village of Isso. The exact location probably is within a couple of kilometres of 38.46 N, 1.83 W.
Cylindrical tank found near Isso. credits: Television Hellín. Initial news reports described the tank as 80 cm in diameter, consisting of a 1 mm titanium shell, partially composite overwrapped, with a mass of 10 kg. Its physical properties and appearance identify it as the hydrazine tank of an Atlas V Centaur upper stage rocket, which is the ATK model 80427-1 pressure vessel. ATK described it as a 59 cm diameter, 86 cm long pressure vessel, constructed of annealed 6AL-4V Titanium and T-1000G graphite hoop wrap, and two spun domes. Its empty mass is 19 km; minimum wall thickness is 1 mm; propellant capacity is 153 kg. The hydrazine tank almost certainly is related to the re-entry of an Atlas V Centaur on the morning of November 3, 2015, over the same region. Several pieces of what appeared to be space debris were found over the next 12 days. The source was initially mysterious due to the lack of any public prediction of a re-entry or acknowledgement of ownership of the debris. Independent analysis of the circumstances of the re-entry and the locations where suspected debris fell identified the source as the Centaur upper stage of the Atlas-V rocket launched on March 13, 2008 from Vandenberg AFB, that carried the NROL-28 payload for the U.S. National Reconnaissance Office. The Centaur had been discarded in a highly elliptical orbit of the Molniya type. It was more than 12 m long, 3 m in diameter, with an empty mass of 2,100 kg. It had the international designation 2008-010B, and the USSTRATCOM (U.S. Strategic Command) catalogue number 32707. Since the Centaur was used to launch a national security payload, the USAF did not publish its orbital elements, nor did it provide any notice or predictions of its re-entry. To-date, the USAF’s public satellite catalogue on its Space Track website has not acknowledged the re-entry of 2008-010B. Suspected debris has been discovered along a 200 km track that parallels the estimated ground track of the 2008-010B Centaur, which travelled from northwest to southeast. A large pipe or duct elbow, with an irregular break on one end, and a flange on the other was found near Monte Bajo, about 3.5 km from Pozorrubio de Santiago, in the province of Cuenca. It has the appearance of space debris, but has yet to be matched to a known part of the Centaur. The newly discovered hydrazine tank was found about 175 km southeast of this object. Three helium pressurant spheres of size, mass and construction matching those of the Centaur were found about 31 km southeast of hydrazine tank, near Calasparra, in the province of Murcia. All five objects were found between 4 km and 12 km northeast of the Centaur’s estimated ground track. 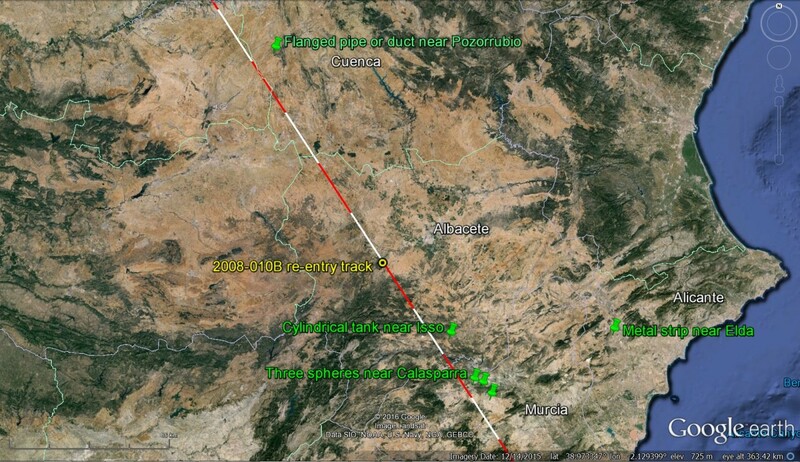 A long, narrow metal strip was found in Las Barrancadas, near Elda, in the province of Alicante, about 80 km from the estimated re-entry ground track. Since this distance is near the empirical limit of re- entry debris dispersion, the object is unlikely to be related to the Centaur. Expert analysis based on the its ballistic and aerodynamic properties, and local wind velocity would help resolve the question. Determining whether it was an identifiable component of 2008-010B would be decisive. Ted Molczan is an amateur astronomer who specializes in observing satellites and analyzing their orbits. His main interests are finding and tracking objects in unpublished orbits, and identifying and analyzing re-entries. He is an Energy Systems Engineering Technologist, who analyzes the use of energy in commercial and institutional buildings in support of improving energy efficiency.